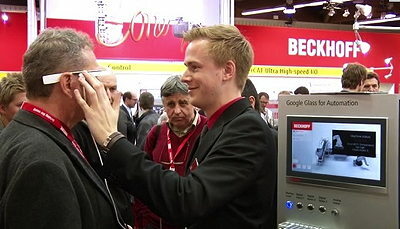 At the recent SPS IPC Drives show in Germany, Beckhoff drew crowds to its stand with a demonstration of how the emerging Google Glass technology could be used to provide machine operators with information such as dialogue messages, videos, Web pages or documentation, while they are working at their machines. 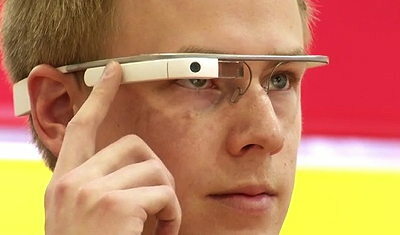 Google Glass (shown above) is a wearable hands-free computer that shows information on a heads-up display in the user’s field of view. The technology, which is still being developed by Google, also incorporates a camera, an accelerometer, a gyroscope, WiFi, Bluetooth, a proximity sensor, memory, and a transducer that allows the wearer to hear sounds transmitted via their skulls. Google is developing the technology mainly for consumer applications, but Beckhoff believes that it could be used in industrial environments to supplement and enhance conventional production practices. For example, service technicians could use the camera to read a QR code on a device such as a motor or actuator and the glasses would then display the history, properties or status of the component. The camera could also be used to take pictures of what the operator is seeing. Andreas Thome, Beckhoff’s product manager for PC control, believes that Google Glass has the potential to change the way machines are operated in future. “We think that it will revolutionise the way that people will interact with machinery on the shopfloor,” he says. In Beckhoff’s demonstration, Google Glass was integrated with the company’s TwinCat automation software. The glasses were communicating with a Web server that was supplying the status of a TwinCat-controlled machine. The glasses receive and display this machine status in the form of signal values or error messages and could be used to pinpoint the error location. The glasses could also be used to acknowledge and reset the machine status.